Flower bouquets are some of my favorite subjects to photograph at weddings. They are beautiful and every bride puts a lot of thought into her bouquet. I have to make sure I don't miss it! This one here is one of my favorite bouquet poses. Why does this image work? First of all, the bouquet is the the only thing that is in focus in this image. You can clearly see that the back of the bouquet is blurred, and only the flowers are bright and in focus. This bride chose some beautiful colorful roses as her bouquet. Another reason why this image works is that you cannot see the bride's face. If I decided to include her face in the image, the viewers eye would be automatically drawn to her face instead of the flowers. I did not crop her face in post production. Instead, I already knew what image I was shooting for and I shot horizontally with the bride's face not being in the image. The lens I chose for this image was my 70-200 so I did not have to stand very close to the bride, I was pretty far from her and I zoomed in to 200mm which gave me very nice lens compression. The bride decided she liked this image so much she wanted to include it in her wedding album. 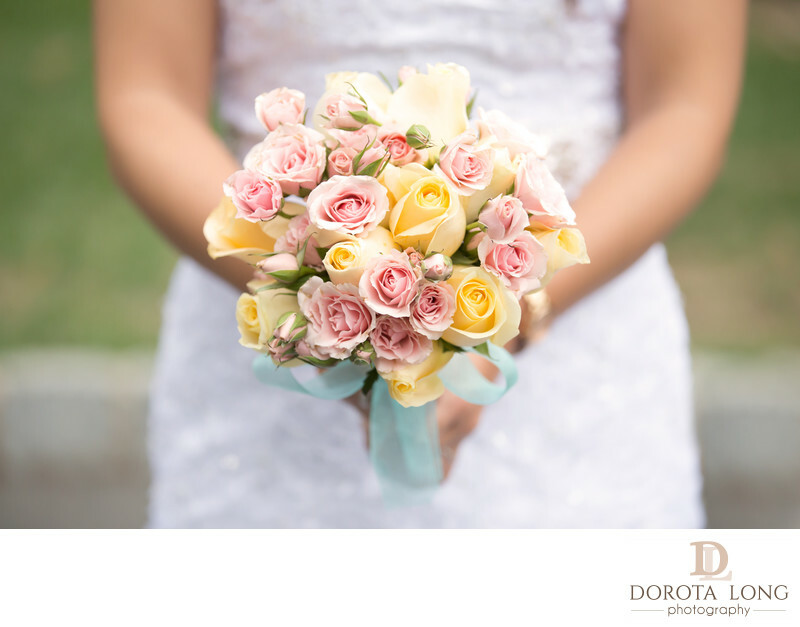 For more information on my wedding albums, please watch this slideshow and e-mail me at info@dorotalong.com for current album pricing. Location: 70 Southern Blvd, Danbury, CT 06810.